Day 221: ‘Trust The Twins’. . .
Back in the summer of 2012 – late August to be exact – we started ‘collecting’ wines for this blog by attending the 75th Anniversary of Twin Liquors. They had some tremendous deals on everyday wines and superb collectible vintages. Several of the bottles purchased at that time are still sitting in our wine fridge. Since that time, we have scoured, not only Twin Liquors, but also, The Main Liquor, Grape Juice and Grape & Grain in Kerrville, H-E-B in multiple locations around Central Texas, Central Market in Austin, Specs Liquor & Finer Foods, Gabriels Outlet in San Marcos and World Market. Who would have thought that there would be so many choices from so many different retailers. It’s clear to us that there are thousands of wine labels out there – many of them just waiting to be tasted, talked about and remembered. Here we are at Day 221, and after a recent visit to Twin Liquor in Austin at one of their West Austin stores, we came upon a wine on special for $11.99, yes – that caught our attention. A 2010 Zinfandel from Lodi, California – one of the GREAT Zin growing appellations in California – named LangeTwins. Okay, a new name to us . . . so let’s do some research. Hmmm, for five generations their family has been growing sustainable wine grapes in the Lodi Appellation and in 2006 they opened a winery to showcase their passion for growing wine grapes – because, as wine lovers and bloggers, we continue to learn everyday, great wine starts in the vineyard. And, since opening in 2006, they have continued to expand their state-of-the-art winery to keep up with the demand for their LangeTwins wines as well as private labels. And we also learned tonight that they’ll be participating in the 2013 Austin Wine & Food Festival on April 26th and 27th as they introduce ‘Caricature’ at the H-E-B booth and offer signed bottles! It’s always cool to come upon something relatively new in the market – or relatively new for us – to taste and talk about. We opened our 2010 Lodi Zin and immediately fell in love with the nose . . . oh, wow, such peppery-goodness and fruity deliciousness . . . it’s a ‘zin-lovers’ delight! Raspberry, blackberry and even black cherry consume this jammy zin with a sneaky black pepper finish. MMMMM, GOOD! A truly luscious wine and a Silver Medal winner at the 2012 California State Fair. All we know is that the stop we made at Twin Liquors was yet another reason why we ‘Trust The Twins’! Considering that this winery will be represented at the Austin Food & Wine Festival later this month – and in the Dallas/Fort Worth (Deb and Mark – can we book a room?) area as well, if you’re in Texas, you’ll want to get your hands on some of this wine . . . we predict that it will sell FAST! One of the really amazing aspects about 221 days of wine is that we are continuously finding new labels and vintages that amaze us. Without the benefit of this ‘labor of love’, we’d probably still be trying the same 10-15 labels we’ve always loved. Instead, we’ve uncovered some real gems from creative wine makers and clever marketers! And, we’ve found some duds in the mix as well. There are still way, way, way too many wines to try in the days we have left, but our goal remains the same–good wines at affordable prices for wine lovers of all shapes and sizes. 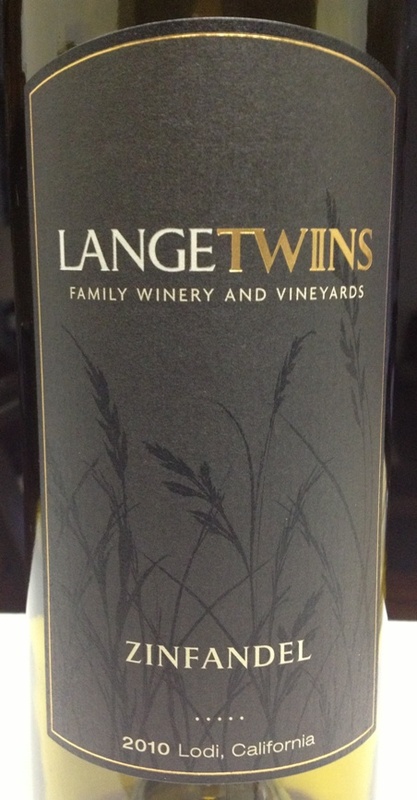 Pass the word on about LangeTwins – it’s a wine worth noting now and in the future . . . hey, they’ve been growing wine grapes for FIVE generations – you think they know a thing or two about quality fruit? Enjoy your bottle of LangeTwins . . . we sure did! Quick shout out on the NCAA Women’s game – we were pulling for the Cardinals to “twin up” with their male counterparts, but ya gotta give the Huskies a high five for a job well done. Hate to see Pat Summit’s record for victories matched, but credit given where credit due. Until tomorrow, remember to enjoy your favorite wine responsibly and recycle whenever possible. Categories: Uncategorized | Tags: 2012 California State Fair, Austin Wine & Food Festival, Grape & Grain, Grape Juice, H-E-B, LangeTwins, Lodi California, The Main Liquor, Twin Liquors, Zinfandel | Permalink.